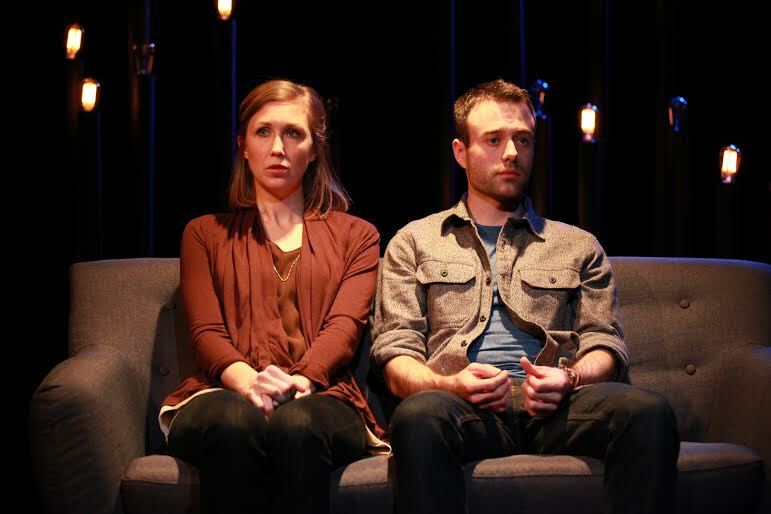 left to right) Bergen Anderson and Dan Wilson in Akvavit Theatre’s U.S. premiere of NOTHING OF ME, by Arne Lygre, co-directed by Chad Eric Bergman and Breahan Eve Pautsch. Photo by Emily Schwartz. Chicago’s Akvavit Theatre is pleased to present the U.S. premiere of Norwegian playwright Arne Lygre’s drama NOTHING OF ME, co-directed by company members Chad Eric Bergman and Breahan Eve Pautsch, playing March 3 – April 3, 2016 at Signal Ensemble Theatre, 1802 W. Berenice Ave. in Chicago. Tickets are currently available at brownpapertickets.com. NOTHING OF ME features company members Bergen Anderson and Kirstin Franklin with Paul S. Holmquist and Dan Wilson. Arne Lygre’s new play NOTHING OF ME is a post-modern ghost story. Not long after an unspeakable tragedy, a wife and mother walks away from her entire life for a new relationship with a much younger man. Is she moving on towards a bright new life, or is she sinking deeper into self-destruction? In a playful yet haunting style, Lygre delves into the bond of love, its force and its dead-ends, using ruthlessly telltale dialogue. The play warns us of the danger we are all guilty of when we imprison others within our expectations, through the very love we feel for them. For additional information, visit www.akvavittheatre.org. Cast: company members Bergen Anderson (Me) and Kirstin Franklin (Person) with Paul S. Holmquist (Ex) and Dan Wilson (He). Dates: Previews: Thursday, March 3 at 8 pm and Friday, March 4 at 8 pm. 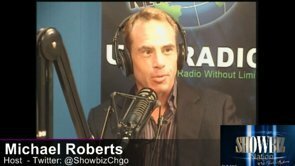 Curtain Times: Thursdays, Fridays and Saturdays at 8 pm; Sundays at 3 pm. Tickets: Previews: $10. Regular Run: $20. Students/seniors $15. Industry $10 on Thursdays and Sundays). Tickets are currently available at brownpapertickets.com. Arne Lygre made his debut in 1998 with the play Mother and Me and Men. Since then he has written six other plays, which has been staged and published in countries around the world. Man Without Purpose was directed by Claude Régy at Odeon Théâtre in Paris in 2007/08. I Disappear, premiered at La Colline Théâtre National in November 2011, directed by Stéphane Braunschweig. For his short stories collection, In Time, he received the prestigious Norwegian literary award Brageprisen in 2004. He has also written two novels, A Last Face and My Dead Man, which both was very well recieved by the critics. He was awarded the literary award Mads Wiels Nygaards’ Legacy in 2010. Breahan Eve Pautsch has been working in Chicago as an actor and director since 2003. As a director, she has worked with Akvavit, Raven Theatre, The International Voices Project, Hobo Junction Productions, Full Voice Productions, Mudgeonsoul Cinema and Stockyards Theatre Project.